Housing Affordability – Best EVER! Housing affordability. From the data, homes are more affordable than ever these days. As the cost has come down and incomes remain somewhat stable, the ZIRP (Zero Interest Rate Policy) of the Fed is allowing for more people to “enjoy” home ownership. 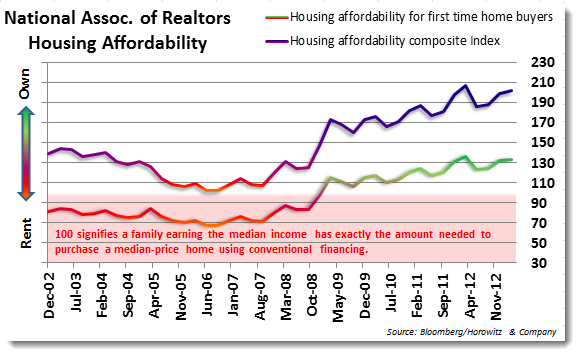 The chart below provides a glimpse into the historical range of “affordability” using a couple of different metrics. Note that there is also an axis that gives an indication when renting or owning is beneficial over the other. HOMECOMP Index – When the index measures 100, a family earning the median income has exactly the amount needed to purchase a median-price resale home using conventional financing. An increase in the home affordability index means that a family is more likely to be able to afford the median priced house. HOMEAFFR INDEX – Shows the ability of renters who are potential 1st time buyers to qualify for a mortgage on a starter home. When this index equals 100, the typical first-time buyers can afford the typical starter home under existing financial conditions with a 10%down pymnt. The first time home buyer median income represents the typical income of a renter family with wage earners between the ages of 25 and 44 yrs. old.